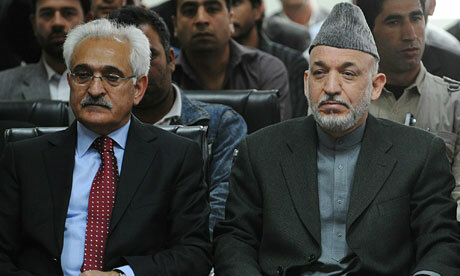 Afghan president Hamid Karzai (right), with his national security adviser Rangin Dadfar Spanta. Photograph: Shah Marai/AFPDid you hear that one about how anti-corruption agents in Afghanistan arrested the country’s national security adviser – who, in fact, may have been a CIA asset – and who then called the president from his cell and was subsequently released? No? It’s quite a story. According to a report published in the New York Times on Wednesday, Mohammed Zia Salehi, the chief of administration for the national security council, was captured by a FBI-mentored anti-corruption agency in July. Afghanistan’s attorney general, Mohammad Ishaq Aloko, himself sanctioned the move. Karzai was allegedly most disturbed by the manner of the arrest: officers went into Salehi’s house in the middle of the night – à la “Soviet troops” – and arrested him. But there seems to be a bigger picture behind the president’s irritation. But is American pressure a certainty? As the most important act of the story unfolds, Dexter Filkins and Mark Mazzetti report that “Afghan and American officials” say that the CIA bankrolls the corruption-dipped rogue that is Salehi – though the report concedes it is unclear which services Salehi may have performed for the CIA and exactly what he gained (indeed, he could have performed several roles). Perhaps his ties stretch back to his former role as an interpreter for Abdul Rashid Dostum, an Afghan warlord who was one of the CIA’s key allies during the 2001 invasion of Afghanistan. If true, the revelation that America has in the past been, or in fact is, simultaneously passing cash to figures such as Salehi, and at the same time demanding an end to corruption in Afghanistan is, to be kind, perplexing. Corruption in the Karzai government has been a constant point of concern for the Obama administration. The complexities of the now infamous Afghan counterinsurgency effort centre around an aim to deal with corrupt officials. This story, then, stinks of major hypocrisy. The connection between Salehi and the CIA casts doubts over how serious the Obama administration sees the fight against corruption in Afghanistan. Some have altered the spin on the matter, suggesting that attacking corrupt officials who are crucial to the war effort could weaken the Karzai government, and consequently damage American efforts in the country. Particularly as the “Afghan strategy” is due for review in December. Quite right. Corruption related to government actors (predominantly in the region in question) often does not provide breaking news: neither to us internationally, nor to those locally. Perhaps it is better, then, not to eradicate, but minimise the dealings with allegedly corrupt officials, keeping in mind the… the “greater good”. And this is where the voices of those who increasingly feel America cannot finish what it began nine years ago get louder. It may not be effective to seek out Mary Poppins, but neither is it an ethical or strategic move to summon Fagin. Such a move is uncontrollable. Salehi was “wiretrapped” in his attempt to gain a bribe in exchange for blocking an investigation into couriers flying from Kabul and Kandahar, usually to the UAE, where many Afghan officials, smugglers and insurgents maintain second homes and live in extravagant wealth – couriers who were carrying much of the New Ansari money. A billion-dollar corruption story from a country where most of the money being pumped in belongs to the international taxpayer. Surely this goes beyond merely having “a hand in the till”? As this story gains momentum, so does its subplot. President Karzai recently defended his decision to disband private security companies working in Afghanistan by the end of the year. The president said that the companies “were running a parallel security structure to the Afghan government”. He continued to blame the companies for undermining the growth of the country’s own security forces. Does the president want to see a speedy transition to a domestically built security infrastructure, or is this yet another sinister move? America’s reliance, therefore, on Ahmed Wali Karzai, a powerful figure in southern Afghanistan where the Taliban insurgency is strongest, and one who seeks to advance his own, personal interests, undermines the American push to develop an effective central government that can maintain law and order and eventually allow the US to withdraw. Self-defeating? Absolutely. President Karzai has struggled to build sustained popularity among Afghans and has long been portrayed by the Taliban as being fully directed by the US. Washington must quickly dump its wavering and hypocritical stance on corruption, and seek alternatives to the bent politicians who have infested the US-backed Karzai regime. Before the story has a fatal ending. Next Sexually Aroused Mullah in Denial!